Anders Breivik denies prosecutor's claims he was a friendless loner. On trial for killing 77 people in July of last year in one of the worst acts of mass murder ever committed, Anders Breivik recently refuted claims from a prosecutor that he was a financially bankrupt loser who spent years playing video games while living in his mother's home. Before committing the attacks that claimed the lives several dozen people, most of whom were teenagers attending a summer camp on the Norwegian island of Utoya, Breivik said he moved back in with his mother in late 2006 to save money after an investment setback. He then spent the next year playing World of Warcraft, sometimes for up to 16 hours a day. Furthermore, Breivik claimed he also moved back home to have more time for writing his manifesto, a 1,500 page collection of hate-filled rambles against multiculturalism in Europe and Islam, and that his supposed game addiction was just a cover for his other activities. But when questioned about his gaming hobbies, Breivik asserted that WoW held no influence over his plans for the July attack. "I know it is important to you and the media that I played this for a year," Breivik told the court about his time playing World of Warcraft. "But it has nothing to do with July 22. It is not a world you are engulfed by. It is quite simply a hobby." Breivik later stated said he spent several months in 2010 extensively playing Call of Duty: Modern Warfare, claiming that he used the first person shooter to help hone his shooting skills because of the in-game holographic sight. He used a similar device when he carried out his attack on Utoya Island. "You could give the sight to your grandmother and she would become a supermarksman," Breivik stated. 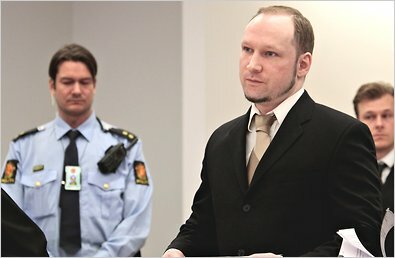 Breivik's trial began on April 16th, and is expected to run approximately 10 weeks. Breivik has admitting to committing the killings, but stated that he acted in "self defense."